Is the Universe Bigger Than It Ought to Be? 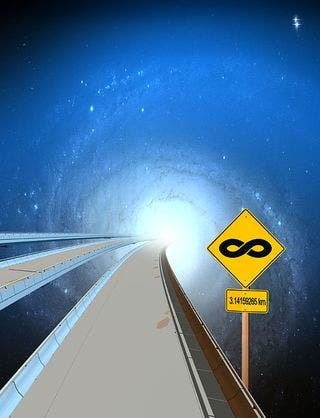 Is our universe infinite or closed? Because the visible Universe is expanding, the most distant visible things are much further away than its estimated 14-billion year age. In fact, the photons in the cosmic microwave background have traveled a cool 45 billion light years to get here. That makes the visible universe some 90 billion light years across. The real universe, however, is much bigger. We now know this thanks to statistical analysis by Mihran Vardanyan at the University of Oxford and colleagues. The key to measuring the actual size of the universe is to measure its curvature. Astronomers have come up with various methods to measure this curvature. One method according to MIT's Technology Review is to search for a distant object of known size and measure how big it looks: "If it's bigger than it ought to be, the Universe is closed; if it's the right size, the universe is flat and if it's smaller, the Universe is open." Astronomers know that waves in the early universe became frozen in the cosmic microwave background. They can measure the size of these waves, called baryonic acoustic oscillations, using space observatories such as WMAP. Another metric is the luminosity of type 1A supernovas in distant galaxies. The problem is that when scientists examine the various data from the different models they get different answers to the question of its curvature and size. So, which is the most accurate? The breakthrough that Vardanyan and team used is called Bayesian model averaging and it is much more sophisticated than the usual curve fitting that scientists often use to explain their data. The Bayesian model asks: given the data, how likely is the model to be correct. This approach, reports Technology Review, is automatically biased against complex models–"it's a kind of statistical Occam's razor. ".